‘Once you’re a parent, you’re the ghost of your children’s future.’ There are plenty of philosophical musings like that in the astounding sci-fi blockbuster, Interstellar, and the film’s detractors may describe them as cod-flavoured. Cynics, beware, as this utterance is very much the fulcrum of Christopher Nolan’s latest cinematic endeavour. The director appears intent on using a genre vehicle to transcend said genre and guide us to a universal message of hope in these dark times. It’s also about space exploration and packed with gnarly set-pieces. So don’t panic! 2001: A Space Odyssey (1968), Star Wars (1977), The Right Stuff (1983) and Contact (1997) have both been heavily name-checked in articles and reviews, but nobody has yet mentioned Chris Marker’s short masterpiece, La Jetée (1962). The French New Wave classic, it can be argued, is also an influence on Inception (2010). In Marker’s experimental short, The Woman (Hélène Chatelain) refers to the time-travelling Man as ‘her ghost’. It might just be plain coincidence, of tropes moving in cycles, and all films suffer the burden of influence, even if it exists like the faint trace from a long-dead star, or fabled dark matter, but La Jetée feels to me a closer relative. 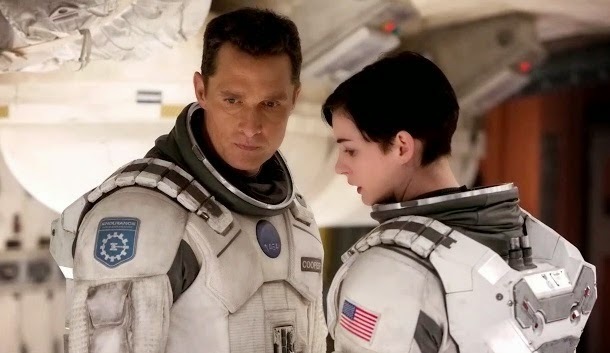 In Interstellar, Matthew McConaughey’s astronaut, Cooper, becomes his daughter’s ‘ghost’. There is no denying that Interstellar is heavily focused on its emotional core. But it’s not a particularly fresh development. The Dark Knight Trilogy is as much an exploration of children struggling under mighty shadows cast by great fathers as it is a superhero adventure. Inception featured a tragic figure haunted by his failures and longing to return home to the family he abandoned. Nolan, however, recently told the The Guardian: “I have been shocked to realise how much more emotional this film is.” This admission will no doubt provide further ammo for those who care little for the director’s works. Perhaps what hinders Nolan is that he’s a curious mix of classicist and iconoclast. The son of an English father and American mother, he conducts himself with classic English reserve and likes his projects to be shrouded in privacy. Some will use ‘secrecy’, but privacy is the more accurate word. In the age of adverts for trailers, blogs reporting on every last detail of a film before it’s even begun shooting, his believe in keeping the audience in anticipation is to be applauded. You won’t find Nolan crying out ‘I’m king of the world!’ He didn’t make the Batman trilogy ‘for the fans’. There can be no doubt at all that his vision for the blockbuster is different from other practitioners of the model. He doesn’t like rapid montage. He doesn’t care for 3D. He will use practical effects when at all possible. He thinks a finished script is a prerequisite of film production. Are these not virtues? Then why so cynical, haters? I genuinely believe he is an extraordinary film-maker giving mainstream Hollywood a well-needed kick up the arse. His major crime to date, if we must charge him with something, is not reining in Zack Snyder with that absurd third-act destruct-o-rama that ends Man of Steel. I’ll concede, here, that in his role as consultant and producer, he fell asleep on the job. Nolan is also that rare thing in today’s version of the studio system: an auteur. A proper auteur, mind, and not of the ‘vulgar’ iteration/school currently banded around in snooty film critic circles. He is also, as stated, very popular with studio brass. After all, he has made them billions of dollars. Nolan, too, managed to circumvent the cliché of the tortured soul plagued by execs and their stringent demands to make the picture dumber. He is allowed – no, make that, encouraged – to produce art films on lavish budgets. Clearly, this rubs some people up the wrong way. He has become a sturdy bridge between personal vision and commercial enterprise. What a position to be in! And yet Nolan is viewed with suspicion. If he dares to run with the notion that blockbusters do not automatically equate as mindless trash for the masses, he’s accused of getting ideas above his station. They pick with delight at his perceived shortcomings. The Internet is itself a black hole, where thoughtful criticism and critiquing is drowned out by braying fools and their brand of mean-spirited snark. He’s their straw man figure, their go-to punching bag. How many vacuous online rants were there about the sound mixing of Bane’s voice, or about plot holes in The Dark Knight Rises? Or dismissals of Inception because it demanded your undivided attention for a little over two hours? In a world where social media has ruined our concentration levels, where even critics can’t help but check their phones and e-mails during press screenings, maybe Nolan *is* demanding a lot? Interstellar wants to instil a sense of awe and wonder. The type experienced when you first go to the pictures as a child and fall in love with moving images on the big screen. You either connect with it, or don’t. It is epic in scope and determined to touch many bases that it occasionally does wobble on its axis. If dialogue and scenes are delivered with all the subtlety of using a sledgehammer to crack open an egg, one still admires/forgives/welcomes Nolan’s attempt at grandeur on both a cosmic and personal level. For all intents and purposes, this is Christopher Nolan’s To the Wonder (2013). A majestic and vividly crafted drama set in the blighted cornfields of near-future Middle America and among the stars, the sci-fi extravaganza takes mind-melting theories of quantum physics and makes them emotionally resonant. 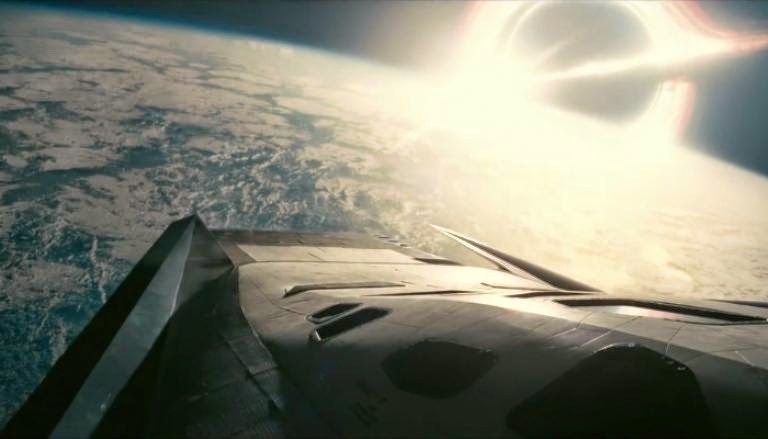 It goes without saying that Interstellar is visually stunning. It should be applauded, too, that Nolan teasingly posits an atheistic universe. Nor is it a run-in with star-beasts lurking in the bowels of a giant ship. It blasts off into the unknown while proffering that Love is quantifiable through actions, deeds and sacrifice. It can punch a hole through time, and is the greatest human force we have. When all is said and done, as the screen cuts to black, the film’s subtext rings loud with a Joycean ‘Yes’. you're right. i have such admiration for this film, even when it falters a bit.